Elevate your stay in Ohio at Sheraton Suites Columbus. Located in the city center of Columbus, our boutique, all-suites hotel is steps from shopping and dining, and just a short drive from Ohio State University, Ohio Stadium and the Greater Columbus Convention Center. 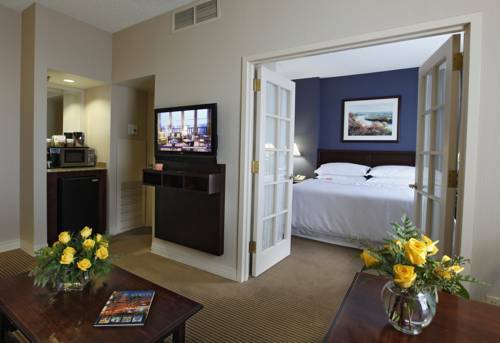 Step into our spacious suites and feel right at home, with complimentary Wi-Fi, parking and a local area shuttle. Perfect for both leisure and business travel, our inviting hotel offers a 24-hour Sheraton Fitness Center, indoor and outdoor swimming pools and a Link@Sheraton business center. All of our spacious suites boast French doors separating living and sleeping areas, Sheraton Signature Beds, two TVs and a refrigerator - ideal for extended stays. Host a meeting or party with us in our sophisticated event spaces. Explore Magic Mountain Fun Center, Alum Creek State Park, the Columbus Zoo and Polaris Fashion Place, just a short drive away. Our boutique all-suites hotel in Columbus, Ohio, welcomes you with gracious service and deluxe amenities. The Grill: Savor delicious American cuisine, from our daily breakfast buffet to gourmet pizza, at The Grill, our signature hotel restaurant inside Sheraton Suites Columbus. Try our Asian seared Salmon or our Ribeye entrees for a relaxing dinner here in Ohio. The Lounge: Gather with friends at The Lounge. Enjoy appetizers like Chicken Wings or Crispy Calamari, or sandwiches, tacos and build-your-own-burgers at our welcoming restaurant and lounge. Relax with cocktails or a glass of wine.